Ohio State finally looked like a number one team on Saturday night and they did it in all black for the first time in school history against Penn State. We are getting further and further along in the season, and as we do it gets harder and harder to move up. This also seems like a great time to drop in a little reminder that these are not predictions, they are merely a commentary on what has happened so far in the no-longer-young college football season. There are certain programs who will never live down certain upset losses in their history. Michigan’s loss to Appalachian State in 2007 is probably the preeminent example of this type of loss, but there are others. Should this semifinal game actually come to fruition the Buckeye faithful would never hear the end of it from their fellow statesmen in Toledo. The stakes and proximity of the fanbases may even make it an even more bitter pill to swallow than the Wolverines loss from ’07. For just a moment, let’s presume this matchup is happening and outline a few ways that the Rockets could pull off the unthinkable. First order of business is to watch the Oklahoma vs. Texas game from earlier this season and emulate Texas as closely as possible. (Side note: don’t emulate any other Texas game from this season). (I repeat: DO NOT COPY ANYTHING ELSE TEXAS HAS DONE THIS SEASON!!!). The Longhorns essentially played keep away from Baker Mayfield and the Sooner offense and just pounded the ball on the ground all afternoon. Toledo has a talented trio of backs and are a solid Group of Five team in the trenches. There’s no guarantee that they could hold up against Ohio State’s NFL development league defensive line, but if they could do enough to get three yards and a cloud of dust it would give them a chance. Secondly, and finally, the Rockets would probably need to force some turnovers. Northern Illinois picked off Cardale Jones and J.T. Barrett a combined three times in a narrow loss early this season, and that would be key for Toledo’s defense as well. Two David vs. Goliath semifinals in one year is just way too much excitement to ask for right? Yeah, you’re right it is. This would be pretty fun though, and it would make the “suits” who want an all-huge program New Year’s Six squirm. 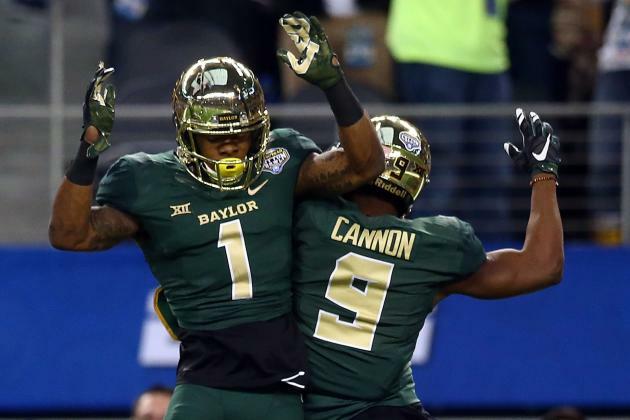 Although Baylor would be a huge favorite, it is fair to point out that this would be a classic “strength on strength” gridiron battle. The closest approximation to what Baylor’s offense looks like is watching the Harlem Globetrotters toy with the Washington Generals while doubling their score. Temple is riding an experienced and cohesive defense to its best start in several years. Just like the previous game, let’s take a second to see how an upset could happen. Obviously, the easy observation is that Temple would need to hold Baylor’s offense in check somehow. No one is beating Baylor in a track race, the Owls need to make it a street fight. If I were Temple’s defensive coordinator, I’d tell my secondary to take a pass interference before a big play every single time and just not worry about setting the record for single game penalty yardage. The other major thing would be, like Toledo, to play ball control and try to move the ball on the ground. That’s easier said than done with Andrew Billings plugging the middle and Shawn Oakman (most fitting name in football) bullrushing off the end. Whoever makes the Rose Bowl’s T-Shirts would be thrilled with this because they’d save so much money on printing costs. Iowa’s largely been an afterthought in the Big Ten this season with Michigan’s rise, Ohio State’s struggling but continuing to win, Michigan State’s expectations, and the feel-good Northwestern story. However, the Hawkeyes absolutely hammered the Wildcats this weekend and might be looking like a legitimate candidate to win the Big Ten. It isn’t necessarily “fun” to watch, and Kirk Ferentz teams pretty much never are, but as long as it keeps winning the Hawkeye fans won’t have a problem with it. 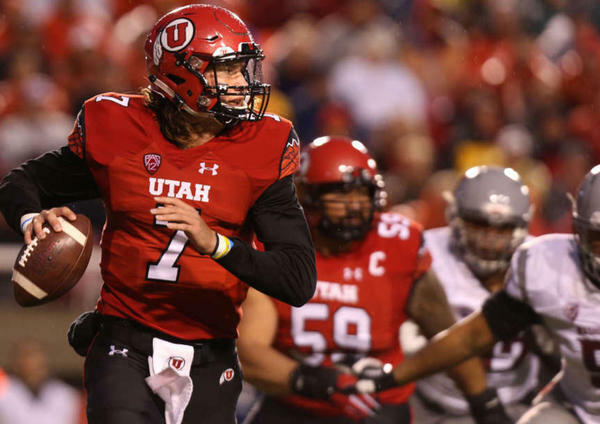 Utah is another team not garnering much recognition despite being undefeated. Part of the reason might be that all of their games kickoff so late that only the true football junkies on the east coast are staying up to watch them. The Utes have looked fantastic so far though beating a Michigan team that has turned out to be good, picking off anointed top NFL prospect QB Jared Goff five times en route to a win, and sending major shockwaves through the conference by emasculating an Oregon team that has been the class of the Pac-12 for the last half-decade or so. Watching Nick Saban and Kirby Smart defend spread teams with dual threat quarterback usually evokes the above reaction from spectators, which is a main reason why, other than Oregon or Baylor, this might be the team that the general public most wanted to see Alabama play in a playoff or bowl game. Obviously the Oregon scenario won’t happen, which is a shame because an Alabama-Oregon seemed like both an important ideology-reinforcing game and a foregone conclusion that it would eventually happen at one point, but now seems like we will never get to see what could have been a generation defining matchup for either dynasty. However, this could potentially be a similar type matchup with so minor twists. The first twist here is that the Horned Frogs haven’t been “on the scene” for nearly as long as Oregon has (had?) been. Secondly, TCU’s Gary Patterson is actually a defensive guy who’s brought in great coordinators, because when you play with the big boys you either adapt or die. That being said, Trevone Boykin is exactly the type of quarterback that has given Saban’s Alabama defenses fits, and the challenge to figure out how to guard a guy like that would be a major addition to Saban’s all-time resume if they could stop a guy like Boykin en route to a playoff or championship game victory. Future 30-for-30 commercial: “What if I told you that the newest FBS conference would outdo the vaunted SEC in the second ever New Year’s Six?” “What if I told you that a conference of misfits would band together to upset the established order?” As it stands now, there are four teams in the AAC who have a combined one loss, and it was to a top-25 Notre Dame team. Houston has been solid all year and Tom Herman looks to be one of the next big hires for someone if not this year in the next two or three years. As with the other Power Five vs. Group of Five fictional matchups, let’s see what this upset looks like. We started the other two with what the team would have to do offensively, so let’s mix things up. When the Seminoles have the ball, Houston’s primary objective would have to be to stop Dalvin Cook. That’s much easier said than done, but slowing him down gives them a real chance. Everett Golson has protecting the ball much better in Tallahassee this season, but he also hasn’t shown that he can beat a good team if the running game isn’t working either. 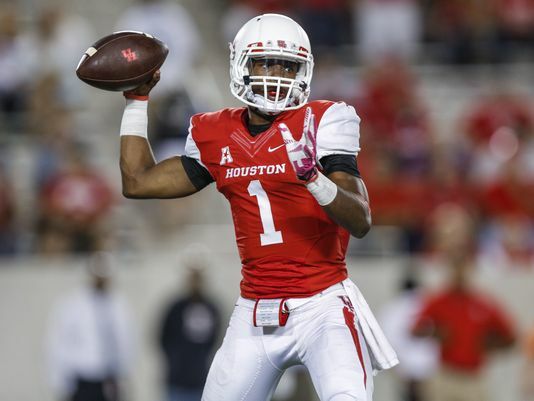 Greg Ward is all Houston needs to score on anyone. Herman is a good coach and a good offensive mind, and Ward’s athleticism is tough to scheme against even with the talent advantage that Florida State enjoys. 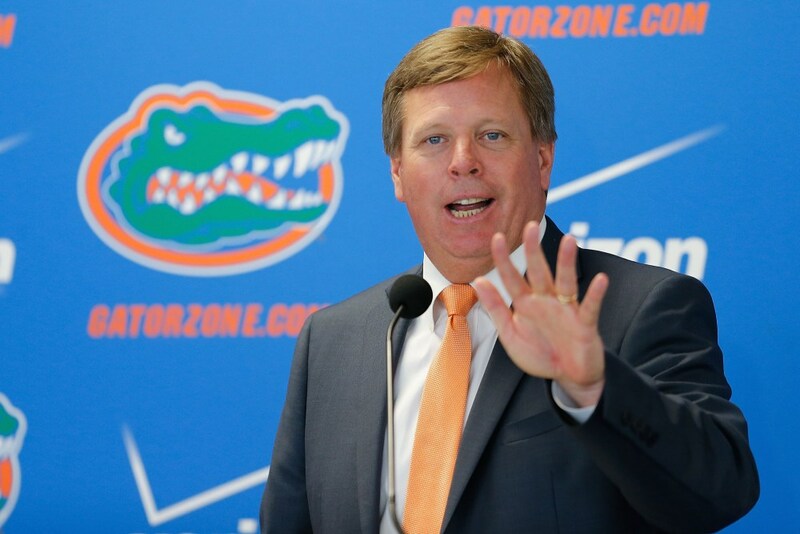 Jim McElwain’s first loss at the helm in Gainesville was a tough one, but the Gators definitely looked like a team that can still win the East and maybe even the conference without Will Grier. Treon Harris is clearly a talented quarterback, and can even do some things that Grier can’t with his legs. The defense is stout and after squeaking by Tennessee and Kentucky, they soundly beat Ole Miss and Missouri. Clemson is a team that hasn’t necessarily looked spectacular this season, but they keep winning and they already have at least one really good win (Notre Dame) and a couple of more that either should have been good or could still end up being ok (Georgia Tech and Louisville). Blowing out Appalachian State is also a pretty underrated win, although you’ll never hear anyone else say that in all likelihood. Deshaun Watson keeps this team in the playoff hunt, but this is a team that probably needs to find another gear if they are to avoid dropping a game somewhere along the way.